Today we climbed Ishizuchi mountain, the tallest mountain in Western Japan. We began the day with the breakfast buffet at the Imabari Kokusai, which is not something to write home about. There was a modest collection of typical Japanese breakfast items like Natto, miso soup, steamed rice, pickles and a seaweed salad, lots of meat items, unappealing egg dishes and a small selection of bread items. While I was making my selections, a Western woman stood next to me. As I always do when people look at me, I smiled and greeted her. She looked me up and down as if she were unable to make sense of who I was, why I was smiling at her, or why I was dressed in a white pilgrim’s jacket, and looked away without greeting me back. I always greet people when we enter the elevator, when I meet them on a mountain trail, or when our eyes meet momentarily. All Japanese people greet me back without exception, but at this hotel I got the “Cold Shoulder” twice. Both times were when I greeted Western people, once when I said “good evening” to a couple who entered the elevator, and the second time, by this lady at breakfast. I probably would have not even noticed it, but I was a bit sensitive and weepy today, and so for absolutely no good reason, their cold shoulders hurt. I was tired of wearing the pilgrim’s jacket that makes me look like I am a deranged dental hygienist who does not know that she should wear the jacket only when she is with a patient, but instead walks around wearing it all day…. I was tired of having no time to meditate each morning since we have to get up, wash up, pack everything in our backpacks, have breakfast and start walking. I was tired of walking all day in the pouring rain, or on the blistering asphalt in the sun, or up steep mountains trails…. I was trying to cheer myself up, reminding myself that climbing up mountings is what I do at home in Colorado for fun, but my self reminded me back that the day after a mountain climb, we grill Paella outdoors, lay on our comfortable sofas and read good books, take a steam shower or I go to paint in the studio. Jules tried making jokes to cheer me up, saying that I should try to look at the situation differently. We do not look like two ordinary dentists, but ones who are wearing the BEST dental jackets money can buy! I was tired of alternating between wearing two pairs of pants, both of them looking like stretch pants. I was tired of feeling tired most of the time, and looking run down whenever I looked in the mirror. The biggest thing was, that I was unhappy with my state of mind. I was unhappy with the thoughts that were crossing my mind, and I had little time to meditate and to center myself again every morning and night. Tears just rolled down my face as I sat there during breakfast. I tried to cheer myself up, since I had no time for self pity, as we had a LONG day ahead of us, climbing Mount Ishizuchi. Ishizuchi means “Stone Hammer,” but Yokomineji, Temple 60 of the Shikoku pilgrimage, is not located on its highest summit, but on one of the lower peaks. It was still a full day of very challenging hiking for me, but mostly because I was still regaining my strength after a few days of sickness. But I did it, and I managed fine. Jules did absolutely GREAT, and he also did his best to cheer me up and to uplift my spirit on the long climb up and down. Jules adds: “I appreciate whatever long forest paths the pilgrimage affords us, since so many of the kilometers are walked on paved roads, albeit narrow ones that often don’t get too much traffic. The forest paths are a visual and auditory treat, and are not only much more interesting, but require so much more mindfulness to negotiate the many half buried rocks and tree roots. There were a few choices of which route to take to climb up the mountain to temple 60. There was the route from temple 59, which included walking along a twisting but gradually ascending road up to a rest area, and from there to climb very steep steps for about 4 kilometers to the temple, through a lush forest full of waterfalls. We walked this trail down on our descent after visiting the temple. Another option was to walk up along a car toll road around a lake and up into the mountains. We did not choose this road. The third option and the one that we chose, was to climb up a dirt forest road that quickly became a narrow forest trail that zigzagged steeply into the mountain and up to the temple. We walked in a dense forest full of tall trees. It was a beautiful but challenging hike. We climbed up and up until we reached the first peak. 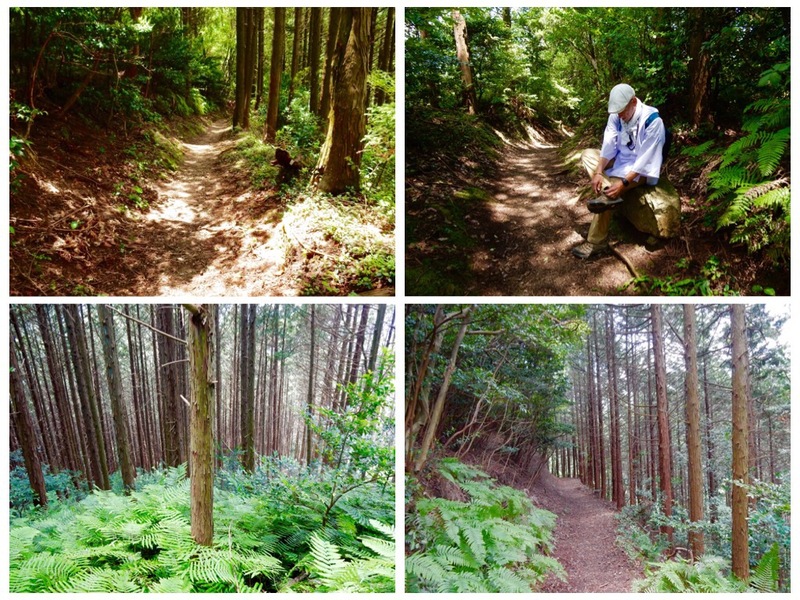 Then the forest path flattened and we walked for a little while across a narrow ridge, before (to our chagrin) we started to go down the mountain for awhile. It is not fun to walk down after your first peak, because you know that with every step down, you are giving up all the advantage you have made in climbing up to the top of the mountain. But that was the curve of the path and we did not walk down very much. After a while, we started climbing steeply up again, until we reached the peak where the temple is located. The last part felt like a long and vertically steep climb, and my leg muscles felt like they were working hard. The signage was good, even though some of the signs were washed away by the recent rains and many rivulets were running down the path between our legs. When we reached the top, we saw many cars of pilgrims who were driving up on this weekend day to visit the temple. The temple was built In the year 651 as an affiliated temple of the Shinto Shrines of the holy mountain Ishizuchi-san. The Shinto Kami (God) of the mountains, was worshipped here alongside the Buddha. But by law, it became an independent Buddhist temple in 1869 at the start of the Meiji Period. The book of pilgrims maps says that this temple is considered the most difficult Nansho mountain top temple on the pilgrimage, because the access to temple 66, Unpenji, is now available via a ropeway. On the way down, we chose to walk a different route. We climbed down hundreds of steep steps and walked down very steep trails, along a beautiful river with many waterfalls. Many times I stopped to admire the beauty of the forest, not to just catch my breath and rest my knees. I reminded myself of the pilgrim’s vow, not to complain nor to feel ANY self pity, but to view all challenges as part of the pilgrimage towards higher realizations. When we had nearly reached the very steep part of the trail, about four kilometers down from the temple, we saw a very old couple making their way slowly, slowly down the steps. I was in awe of their strength, since they were obviously very old, physically crooked and walking with great care, but they still did it all the way to the rest area, which is also where they had parked their car. We had to walk an extra 12 kilometers down the road to reach our train station. I was so tired, that when we finally reached the road, we entered the very first cafe we could find. It was 5:00PM, but luckily the cafe was open until 6:00PM. We had iced coffees with honey, and toast with cinnamon. Our train was at 6:00PM and we still had a few kilometers to go to get to the station. I asked the owner to call a taxi for us so we would not miss the train. The taxi driver said that it would take him 15 minutes to get there. I was hesitant, since I knew that we would not make it to the train on time, but then one of the regular customers said that he would drive us to the station. He went home, which was around the corner, and returned a moment later with his clean car. We squeezed into his car and he drove us to the station. We made the train by two minutes, which felt like a gift from God, with the man acting like a guardian angel. Later, after we soaked in the hotel’s Onsen and rested a bit, we went to dinner at a nearby Donburi restaurant that had Okonomiyaki grill tables. We ordered every vegetable they had on the menu, and grilled ourselves a delicious feast. It was so tasty, that we regretted not eating there before, having had mediocre Chinese food at the hotel’s restaurant the night before. That night I thought about all the people I had run into that day. On one hand there was the woman who gave me the cold shoulder, because I did not look like somebody you should smile at, with my dental hygienist white jacket and my weird looking hat. What a cold and self guarded woman….after all, what does a smile cost? How can anyone not greet another back?…. Then there was the drunk who I met when I stopped to use the toilet at a train station. He ran after me to tell me that there was a newer and better toilet on the other side of the station, and that I should not use the smelly squatting toilet by the train. After I was done, when the drunk man saw me looking for Jules, he came over to tell me that Jules was using the other toilet and that he was still inside. What a kind and wonderful soul that masquerades himself as a toothless drunk…. Then there was this kind man who we met at the cafe, who ran home to bring his car to drive us to the train station in minutes. What a kind and considerate soul…..